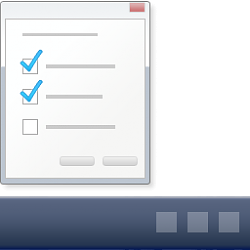 When you right click or press and hold on an app on the taskbar or Start menu, it will open the app's jump list. Jump Lists is a feature that lists app specific tasks or items you can quickly open or get to for every day usage. Jump lists can include recently opened items, frequently opened items, tasks, or websites, in addition to pinned items. You'll always see the same items in the jump list for an app, regardless of whether you view the jump list on the Start menu, taskbar, or File Explorer. On the taskbar, jump lists appear for programs that you've pinned to the taskbar and programs that are currently running. On the Start menu, jump lists appear for programs that support having a jump list. In Windows 7 and Windows 8, you are able to drag and drop pinned items on jump lists to rearrange them in any order you wanted. Unfortunately in Windows 10, you are no longer able to simply drag and drop pinned items on jump lists to rearrange them. This tutorial will show you how to rearrange pinned items on jump lists to any order for your account in Windows 10. 1. Open the jump list you want to rearrange the pinned items for. The most recently pinned item will appear at the bottom of the jump list, so be sure to keep that in mind when re-pinning items to the jump list. 1. Open File Explorer (Win+E). The pinned items in quick access are the same pinned items on the jump list of File Explorer. I've tried clearing out everything in the Win10 pinned list for Excel 2016, and in Excel's "Recent" list. I then open then close one-at-a-time the workbooks I want in the Win 10 pinned list in the order I want them to appear, First opened at the top, second opened, second from top, etc. As long as I keep Excel open the order in the "Recent" unpinned list remains as I want it, I can also move these items to the pinned list in the order I want, but when I close Excel then reopen it the Win 10 pinned list has reversed the order so the most recent is at the top. Opening Excel I find it's "Recent" pinned list has also been reversed with most recent at the top. Apparently Microsoft has decided that the most recently opened item will appear at the top in all 3 cases. Is there any way I can fix the order of any of these 3 lists? I'm using Win 10 1709 last updated 4/5/19 and the .msi installed Office 2016 updated 4/5/19 also. I'm not sure for the recent items. If you pin them in reverse, do they get reversed again to how you want when you close and reopen Excel? Yes. Microsoft appears to have locked in a push down list of last opened at top in all 3 cases. Ooops, there are 4 cases, not 3. When I pin the items in the order I want in the Win10 "pinned" list they appear to stay pinned in that order (so far). It's the Win 10 unpinned list and the office 2016 pinned and unpinned lists that revert to a last opened on top push down list. All times are GMT -5. The time now is 15:17.